თაბუკაშვილის ქ. 5 (ქაშვეთის ეკლესიის უკან), თბილისის სახელმწიფო სამხატვრო აკადემია, რესტავრაციის, ხელოვნების ისტორიის და თეორიის ფაკულტეტი. 2 ს. დარბაზი. გამანადგურებელი პროგრესი: თანამედროვე ხელოვნების პრაქტიკის გაჩენა სასომხეთში. ამ ლექციაში სომეხი კურატორი და ხელოვნებათმცოდნე ვარდან აზათიანი განიხილავს სასომხეთში 1970–იან წლებში თანამედროვე ხელოვნების პრაქტიკის გაჩენას და მის დინამიკას. იგი, სასომხეთში თანამედროვე ხელოვნების პრაქტიკას განიხილავს როგორც ბოლო ნაპერწკალს დამანგრეველს ბოლშევიკური კულტურის პოლიტიკისა, რომელიც სასომხეთის გასაბჭოებით 1920 წ–ს დაიწყო. აზათიანის აზრით, ზუსტად იმ მიზეზის გამო, რომ თანამედროვე ხელოვნება ამ ძალების დანგრევის საბოლოო წერტილია, ის სტრუქტურულ ოპოზიციაშია და იდევნება ბოლშევიკური კულტურის პოლიტიკის მიერ. 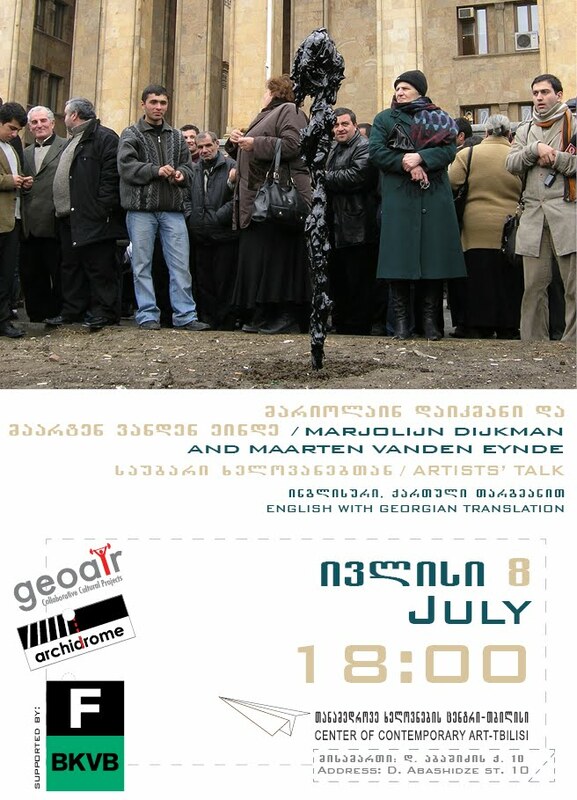 In his lecture art historian VardanAzatyan intends to discuss the conditions and dynamics of the emergence of contemporary art practices in Armenia in 1970s. He considers contemporary art practices in Armenia as a last spark in the long history of the disintegration of the Bolshevik cultural policies introduced by the Sovietization of Armenia in 1920. He argues that precisely because of being the final point of the breakdown of those policies, contemporary art practices in Armenia are in structural opposition to, and therefore haunted by the cultural policies of Bolshevism. vardan azatiani aris xelovnebis istorikosi da mTargmneli, romelic specializirebulia Tanamedrove xelovnebasa da xelovnebis istoriografiaze. vardani erevnis, saxelovnebo akademiis asocirebuli profesoria. igi iyo miwveuli profesori kolumbiis universitetSi da stumar - leqtori holandiis saxelovnebo institutSi. mis bolo naSromebs miekuTvneba statiebi oqsfordis saxelovnebo JurnalSi, Springerin-Si, The Internationaler-Si. igi aris saerTaSoriso art kritikosebis asociaciis wevri da Tanaredaqtori, maldom malsTan erTad gamocemisa Cultural Memory ( plimut presis universiteti, 2010). man somxurad Targmna iseTi mniSvnelovani naSromebi, rogoricaa georg berkelei da david humi. Vardan Azatyan is an art historian and translator specialized in the history of contemporary art and art historiography. He is Associate Professor in art history at Yerevan State Academy of Fine Arts, Armenia. He was a Visiting Professor at Columbia University and a Guest Teacher at Dutch Art Institute. His recent publications include articles in Oxford Art Journal, Human Affairs, Springerin, The Internationaler. He is a member of International Association of Art Critics and a co-editor, with Malcolm Miles, of the volume Cultural Memory (University of Plymouth Press, 2010). He is the translator of major works by George Berkeley and David Hume into Armenian.